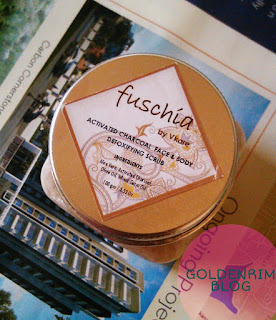 Fuschia products never ever disappoint you and am sure many of you feel the same way. After using two of their scrubs am posting another scrub review. This scrub is a little bit different in terms of scrubbing as well as effects. Read on to know what makes this scrub different from the previous scrubs. The scrub is creamy in colour as well as in nature, but extremely non sticky and non oily. The scrub particles are small sized. The packaging is very travel friendly and easy to use. The fragrance is very pleasant and floral in nature. The fragrance lingers a bit but is not bothering. I used the scrub both ways with water and without water. Firstly I just took a little bit of scrub and slowly scrubbed my face and washed it off. Secondly I dampened my face a little more and used the scrub the sane way and the effects differed in both the cases. The scrub when used alone without water is more efficient than when used with water. The scrubbing effect provided by the scrub is very good as it cleared my small white heads also. The scrub also effectively removes the dead cells and dirt. The scrub also gets washed off easily. The scrub also doubles up as s moisturizer. The major USP of the Fuschia scrubs is that even being creamy in nature they are extremely non-oily, non-greasy and non sticky; they also double up as a moisturizer and you make skip the moisturizing step after using them. This scrub in particular gives a subtle glow to the face and a purified look. This may be due to the presence of activated charcoal. Using this scrub for a long time will surley yield amazing benefits to the skin. The scrub effect is very good as it clears the dead skin cells as well as dirt and oil. Loses power when used with little more water. Price and shelf life - 400 INR for 100g and shelf life not mentioned. I would highly recommend the Fuschia Activated Charcoal face and body detoxifying scrub as it detoxifies the skin and moisturizes as well. The scrub is very effective in it's scrubbing effect also. The scrub is creamy and at the same time non oily. I would totally recommend the Fuschia scrubs to all types of skinned beauties to try at least once. Let me know your thoughts plus urls.